Lam Soon Plantations Sdn Bhd has been a member of the Roundtable On Sustainable Palm Oil (RSPO) since 2007. In August 2017, the company was RSPO certified for production of sustainable crude palm oil (CPO) and palm kernel. 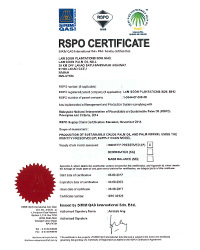 With this certificate, Lam Soon Plantations Sdn Bhd can sell certified sustainable CPO and palm kernel from our oil mill, utilising Identity Preserved (IP) supply chain model.